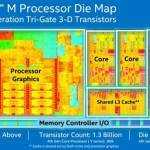 Up until now, Intel CPUs have been labelled based on their nominal clockrate figures. With ‘Speed Stepping’ the CPU clocks were allowed to range between a min and max figure. With the introduction of Turbo, the idea of short-term overclocking was introduced. Although it became hard to determine long-term performance figures due to thermal capping, there was always a relationship between the CPU part number and the clock min and max range. With programmable TDP CPUs, that’s not true any more because one part number can now be configured by the manufacturer to perform at different programmable ranges and nominal clockrates based on the thermal requirements of the design. VRZone have published some details of the new mobile CPUs which include the new programmable TDP features. Details are also given on the two previous parts we’ve reported on, the Core i5-3427U and Core i7-3667U. All the parts are new ‘Ivy Bridge’ designs and should be in devices in the June-July timeframe. All of these CPUs have potential to be used in Ultrabook designs. The range starts with a Core i3 at 1.8Ghz. Remember that the TDP figure includes GPU. Core i5-3427U – 1.8Ghz at 17W TDP, 2.3Ghz at 25WTDP with speed stepping down to 800Mhz. Core i7-3517U – 1.9GHz again with speed-stepping down to 800Mhz. Turbo goes up to 3.0Ghz (2.8Ghz dual-core). TDP ranges are 14, 17 and 25W. VR-Zone suggests that the parts ending in ‘17’ will be the Ultrabook parts at they lack some high-end technologies not commonly needed in consumer laptops. I’ve highlighted those parts above. What you really need to know is not the part number but how a CPU is programmed inside an Ultrabook. A higher programmed TDP will indicate a higher maximum sustained clockrate although in the Ultrabook world, all parts are likely to be programmed at 17W TDP with some lower-end devices (or smaller devices – 10” and tablet designs come to mind) using a 14W TDP setting. Overall though there’s some useful increases in sustained clockrates but a larger gap between Core i5 and Core i7 than we saw in previous Ultrabook CPUs. When a silicon die can be produced at a high quality and high yield rate it’s simpler for Intel and for the manufacturers to be able to buy one part and to program it such that it can be used in different thermally limited designs. For most users it means nothing. For part number watchers, it means a little more work in determining nominal clockrate and for hackers, there’s potential to do some modding. We’ll keep you posted on the details of Ultrabooks that launch with differing configurations and you’ll always be able to view the CPU name and the nominal clockrate of devices in our database. As always, be aware that short-term testing of CPUs at high Turbo rates to produce performance figures is not a good real-world test. This article written on a current generation ‘mobile’ Core i3 2330M, nominal 2.2Ghz locked at 800Mhz – Yes, if you want lower TDP, you can always choose ‘power-saver’ mode in older generation CPUs! I don’t really see how programmable TDP benefits that much since Turbo mode is heat limited and will go over TDP. Unless they changed that (which would mean a lot lower turbo clocks, so unlikely). Benefits are pretty obvious for a market that always balancing performance with battery run time. Laptops range from long running but low performance solution and high powered but short run time solutions. Programmable TDP means they no longer need to worry as much about optimizing for those extremes. For the manufacturers this means fewer chip variants are needed and they can lower some of their manufacturing costs. For consumers, as long as they don’t completely lock the feature, it means the same system can be optimized for either ULV like usage and/or performance demanding usage as user preferences requires. Though for some this may be limited to just when the system is running from AC or battery but the more premium systems should allow full control. How that effects Turbo Boost will vary but optimally it means the system can run cooler when idle or otherwise in low performance mode and that can give Turbo Boost a little more leeway before the system gets too hot and has to throttle the boost. While also allowing the system to potentially cool faster and be ready to provide full Turbo Boost in a faster recovery period by going into a much lower power mode that present systems are capable of going into. Turbo Mode 2.0(Sandy Bridge) allows going over TDP up to a fixed short amount of time. Most usage scenarios involve the CPU being in load for a very short amount of time. You won’t see a difference in performance between various Configurable TDP(cTDP) modes most of the time. The point of cTDP is when you do NEED TO RUN AT LOAD for an extended period of time. cTDP devices are said to have identical max Turbo clocks between multiple power modes. When you run at full load for too long though, lower TDP modes lose that clock faster. Remember chassis designs are designed around WORST CASE power scenario, which is what TDP is.